Quilted and embroidered European sham. 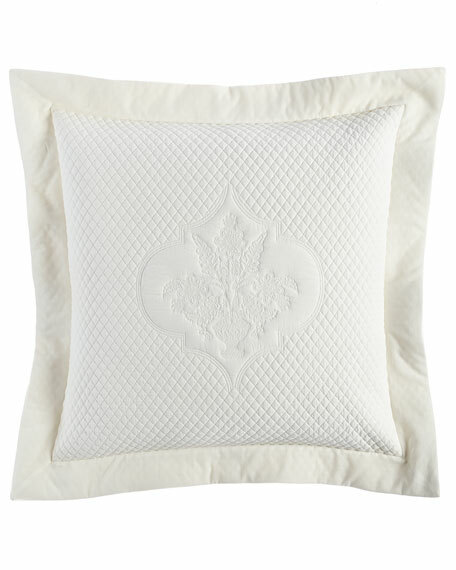 EXCLUSIVELY AT NEIMAN MARCUS Diamond-quilted sham. Solid 3" mitered flange. Two-piece solid back. Pre-washed fabric. Cotton/polyester. Dry clean. 26"Sq. Made in the USA of imported materials. EXCLUSIVELY AT NEIMAN MARCUS Geometric sham with silk piping. Zip closure. Front: polyester/silk. Back: cotton/polyester. Dry clean. 25"Sq. Made in the USA of imported materials.